Up to 1200 new residents could be headed for the highlighted areas. 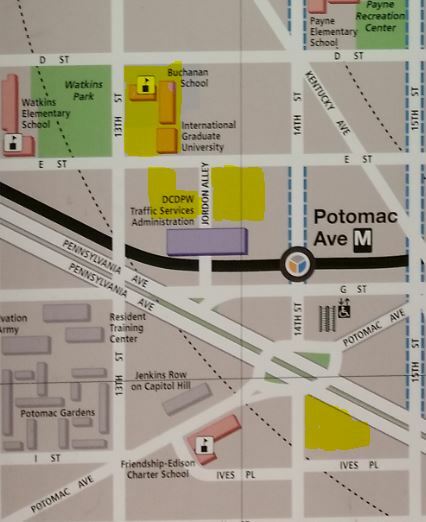 ANC6B’s Subcommittee on Public Unit Developments (PUDs) met last Tuesday to begin planning for exacting community benefits from developers of three major projects near SE Safeway. The benefits come to the community in exchange for allowing developers to build larger buildings accommodating greater density than would otherwise be permitted by zoning regulations. Joel Lawson from the Office of Planning was present to brief the Subcommittee on the overall PUD process. 1300 block of E Street, SE, Opal LLC, Watkins Alley residential project – 100 to 150 residents (Watkins Alley is indicated by the large yellow square to the right of “Jordon Alley” on the map above). Burger’s plan is for the Subcommittee to hold two more meetings to discuss a benefits and amenities package. A July meeting will involve the specifics of a list of detailed proposals. A meeting in September will be held to modify the list. The Subcommittee negotiates with the developers to formulate a final package to take to the full ANC for approval. During its consideration of the developers’ request for zoning changes, the Zoning Commission will consider the list and ensure that the benefits are things that the developer is actually providing. The developer is required to provide a detailed synopsis of the benefits and how they will be accomplished. The package is then incorporated into any Zoning Order granting the change in zoning requested by the developer. * affordable housing: What kind of annual income for a family of 2 (2 adults) is affordable housing? What kind of annual income for a family of 4 (2 adults and 2 children) OR (1 adult and 3 children), etc. * transportation related issues: It’s probably safe to say, ANC 6B residential parking is already tight. What are the developers offering so as NOT to add to the tight parking situation? Current residents look to their ANC 6B representation to insure this situation does NOT get worse. * “Upgrade the area around Peter Bug Academy”: As ‘beauty is in the eye of the beholder’ — so too “upgrade” is embraced for those that ‘reap the benefits’ while on the other hand, “upgrade” is lamented by those whose rent rises and eventually they cannot afford their place anymore. There are neighborhood services in that “area around Peter Bug Academy”. Is this “upgrade” some euphemism for ‘getting rid of those neighborhood services’? That’s all for now. Thank you for the reporting. Echoing a part of another comment: 1200 new residents? How many NEW and dedicated parking spaces from the builders? And don’t tell me they will all only ride bicycles, do car-shares and take metro. I’m not anti-development but please be realistic about people wanting to have cars, and needing to plan accordingly. Regarding what the city considers affordable, that information is published on dhcd.dc.gov. Search for dhcd Rent and income program limits. Nice map graphic. Very useful. Collective community amnesia must be afflicting Capitol Hill. Rather than looking to developers as benevolent providers of community needs, the ANC should be focusing on the nature of the zoning exemptions being sought. As evidenced through the Hine project, the community benefits associated with the PUD will evaporate and the zoning exemptions will escalate. Lucy will never hold the football for Charlie Brown. I guess I never realized how many new residents would be in the relatively small area. That doesn’t even count the almost finished project at the end of Pennsylvania. that is way too dense for that area. where are people supposed to park their cars? the problem is these investors have no real interest in the city besides money. we need to take a stand to stop all of this over development.